Multifamily businesses are struggling to scale. 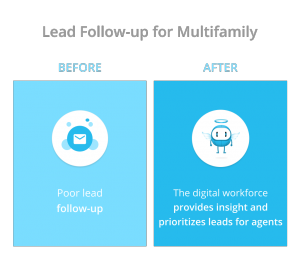 We diagnose the problem and recommend a digital workforce solution to rapidly modernize multifamily marketing & operations. A digital workforce is not science ﬁction. We already live in a world of autonomous cars, robotic process automation & online ﬁnancial advisers. This guide explains the Humans + Machines strategy for a digital workforce. It shows how to incorporate this strategy into multifamily marketing and operations. Everyone seems to have their own definition of scaling, so let’s start by stating what we mean by ‘scalability’. We consider multifamily marketing & operations as ‘scalable’ if large increases in revenue do not require equivalent increases in costs. When a property management company (PMC) that isn’t scaling adds new properties, it has to grow its marketing and operations teams in direct proportion to the number of properties it is adding. This additional staff is expensive and cuts into net operating income (NOI) of the new properties. Let’s take a look at the problems that arise when you are not scaling operations. Property management companies know their lead follow-up is weak, systems are not consistent, and scalability is difficult to achieve. Multifamily employees, such as agents and marketers, spend a lot doing the same repetitive, and time-consuming tasks. Yikes! That’s a lot to take in. Multifamily employees can’t get everything done. Some tasks are dropped and others are left incomplete. This causes employees to become frustrated. Additionally, they have little time to focus on the inspiring and energizing parts of their jobs. This combination decreases employee satisfaction. Ultimately, leading to a decrease in employee productivity. Learn more about how employee satisfaction affects productivity. According to a study done by Hyly, 45.8% of 3rd Party Managers did NOT respond to inquiring prospects. In other words, almost half of the prospects actively reaching out to 3rd party managers are being ignored. This gives competitors the opportunity to convert these leads into leases. For multifamily, fewer leases are signed due to the lack of responsiveness.Additionally, it causes the company’s reputation to suﬀer. This results in fewer management contracts… which means the company is less scalable. Learn more about follow-up in multifamily. Nurturing communications inform, educate, or excite prospects about a property. Nurturing prospects is a key step in getting leases signed. Why? Because people are more likely to sign with a company they know and trust. Unfortunately, agents don’t always have time to carefully craft nurturing responses for each lead. This results in agents missing an opportunity to build relationships and sign leases. The survey by Hy.ly showed only 12.5% of 3rd party managed properties respond with nurturing emails. Meaning, 87.5% of responses did not engage or educate the prospect. The lack of lead nurturing causes leads to be less engaged, less informed, and less likely to sign a lease. This lowers the profit margin a PMC can offer owners. Learn more about the importance of relationships in multifamily. In the multifamily industry, resident retention is often overlooked. Multifamily had a turnover rate of 54% in 2012, according to the NAA Survey of Operating Income and Expense. Often, property management companies don’t take the time to welcome, engage, or cultivate a sense of community to improve resident retention. Companies who don’t prioritize resident retention are missing out. It is cheaper to keep residents than sign new leases. When a PMC fails to engage residents, the residents are far less likely to renew their leases. This forces managers to spend more time and money to keep properties filled. Most property management companies don’t have the necessary resources to thrive. Learn more about the cost benefits of resident retention. All of the symptoms point to one simple diagnosis: Multifamily is not structured to scale. It’s processes are dependant on repetitive clerical work that leaves little time for one-on-one communications. While other industries have modernized their processes & technologies, multifamily has not kept up. PMC’s are not structured to create consistency and repeatability in their operations. PMC’s rely heavily on human mediated processes. This results in long training cycles, and blocks attempts at synthesizing or improving operations. Relationship building is the foundation of multifamily. Agents use different styles to grow relationships based on their experiences and personality. The style differences between agents is what makes the multifamily industry unique. However, it also leads to inconsistency. Experienced agents have refined the cadence of reaching out to leads, but new agents often have not honed their outreach skills. Some worry about annoying leads and don’t reach out enough. While others may be aggressive and bombard leads with emails. This leaves the leads unsatisfied, unlikely to refer a friend, and unclear about the company’s values. The inconsistency causes agents to have ineffective lead engagement and leaves each prospect with a different customer experience. This results in fewer leases signed and lower resident retention. Additionally, this makes the PMC less attractive to owners. Also, the company has to spend more time and money on lead generation. This inconsistency increases costs and decreases NOI. Learn more about the importance of a consistent customer experience. New employees average six months before they are fully trained. Now, let’s add multifamily’s lack of consistency into the mix. The lack of consistency means it takes longer to train each employee because everyone has their own method of getting the job done. This makes your staﬀ work harder to do the job. So, either more things are going to fall through the cracks or you need to hire more staﬀ. Now look at a company that has mastered scaling, like McDonald’s. A line cook with no experience can be trained in only three days! Decreasing training cycles is a big deal considering property management companies experience a turnover of 32% every year. Even after 6 months, many employees ignore their training. This results in fewer signed leases and fewer property management contracts. Learn more about training cost. All of the above symptoms are the result of structural issues that make consistency, repeatability and scaling almost impossible. Companies need clear, consistent, repeatable systems in place to scale their operations. Before we jump into the treatment options, let’s explore how McDonald’s structured itself to be scalable. Think about this: the chefs who create these recipes have trained in their craft for years, sometimes decades — but the crew that prepares the fries are trained within three days! Now, that’s mastery of scale. How Consistent Are Your Operations? When you think about scaling your own operations, are you able to identify areas which would benefit from this idea of consistency? For example, do you nurture your leads consistently? As another example, is your resident renewal program consistent? Do your residents receive an offer to renew when their lease is up? Do your residents receive a friendly notice reminder? Do your residents receive a helpful move-out checklist, if they don’t choose to renew? Let’s see how consistency can drive scaling in multifamily. Multifamily operations can be designed for scale and agility. The trick is to start with a consistent process. In the next chapter, we’ll look at how a Humans + Machines strategy can help multifamily scale. The traditional approach to scaling is to increase the workforce. Seems simple enough. But, there are some major issues with this approach. Issue #1 Hiring is expensive: With a human-only approach, growth requires hiring more employees. These extra salaries are a big expense that shouldn’t be overlooked. Issue #2 Training takes time: As previously discussed, training is a long, time-consuming process. Longer training times result in delayed employee productivity. Plus, you have to increase your training budget to add more trainers. Issue #3 Lack of compliance: Training doesn’t guarantee employees will use best practices. People make mistakes. Plus, people can be stubborn. Some employees may not want to use the best practices and will continue to do things their own way. In other words, employees are expensive, training has a delayed payback, and employers are perpetually ‘wishing and hoping’ employees put their training to good use. These factors prevent a humans-only workforce from scaling operations. The next option is to completely remove the employees from the equation. How? By fully-automating the processes. This resolves the training issues, but also creates a new set of problems. Issue #1 Technology isn’t ready for full automation. Maybe in the next 20 years, technology will be able to function independently. But for now, we need humans. Issue #2 Lacks personal connection. Multifamily is built on trusting relationships between agents and customers. By fully automating, a company loses the personal connection to the customer. People are more likely to trust a person than an automated software system. While this approach may save training costs and provide consistency, it removes the personal aspect of the apartment search. This will decrease sales and is unrealistic for the near future. The world cannot rely on machines alone. We still need the human element to understand buyer needs, solve problems and build relationships. Yet, people cannot do everything themselves either. There’s just too much to do. So, what should we do? Redefine the workforce. Tomorrow’s workforce will have an advantage: machines and humans working together. We call it a Humans + Machines strategy. In a Humans + Machines approach, people execute tasks that require skills machines lack, and vice versa. It allows each workforce to focus on what they are good at. Combining human and machine efforts produce results that are faster, smarter & more efficient. This frees up marketers and agents to focus on higher value work. So how can a company augment their workforce? By creating a Humans + Machines workforce! The Humans + Machines strategy incorporates the consistency and affordability of the digital workforce and the personal and the thoughtful nature of the humans workforce. Next, we are going to look at some of the greatest Humans + Machines successes! The future of multifamily is Humans + Machines workforce. Management companies in the multifamily industry rely on a humans-only workforce. This results in using insuﬃcient processes, systems and technologies to manage their businesses. We live in a world where a Humans + Machines approach works best. It maximizes human potential, pushes machines to be the most useful, and delivers the best service to customers. Some of the most impressive productivity achievements are the result of a Humans + Machines system. We are going to explore some of the greatest Humans + Machines successes here. What Does ‘Workforce’ Mean to You? Machines, algorithms and bots are just as much a part of your workforce as your employees. You don’t have to look far to see Humans + Machines systems at work. This idea is being used in everything from cars, apps, and classic games. 69% of senior business executives think the term ‘workforce’ will encapsulate both humans and machines. The safest driver on the road is a Humans + Machines wonder. American automaker Tesla first introduced “autosteer” functionality to its vehicles in 2015. Tesla has been the front-runner in the race to autonomous driving. Teslas driven with autosteer average one fatal accident every 3.34 million miles. Meanwhile, vehicles driven by humans average one fatal accident every 492,000 miles in the U.S.
Tesla realized there are aspects of driving that machines are better at than humans (think: blind spot detection). However, it recognized that humans trump machines when it comes to judgement calls. That’s why every Tesla car needs the driver be in charge. Tesla has humans and machines work together to deliver a safety system that surpasses anything else in the industry. In the 1980s and 1990s Garry Kasparov was the best chess player in the world, being ranked number one for 225 out of 228 months. In 1997, this changed. IBM supercomputer “Deep Blue” beat Kasparov. However the success was short-lived. In 2005, two chess amateurs named Steven Cramton and Zackary Stephen entered a chess competition with the aid of a machine. The machine had an extensive database of personal strategies and was combined with Cramton’s and Stephen’s judgment and instincts. Cramton, Stephen, and the machine won that tournament, defeating other grandmasters and computer programs. They proved that a combination of human and machine skills produced the best chess players in the world. YouTube uses a Humans + Machines process to identify violent or extremist content. With over 400 hours of content uploaded every minute, it would be impossible to do this with a human-only workforce. This process has had a 98% success rate when vetting videos, with the remainder being passed along to humans to analyze. The Humans + Machines system allows YouTube to multiply their workforce! The Humans + Machines Workforce is Here! Ready or not, the age of humans working with machines is here. To keep up, we recommend adding a digital workforce to assist the human workforce. By playing to each workforce’s unique strengths, you can increase productivity and scale your operations like Tesla and YouTube! Next, we look at how the digital workforce can make multifamily successful. Speciﬁcally, how it can improve multifamily workﬂows and increase employee satisfaction. The digital workforce is not used to its potential in multifamily. A multifamily CRM, for example, feels like a book keeping ledger for agents to make calls, notes and email entries. However, machines and algorithms can do so much more to help the human workforce. The strength of the digital workforce stands in contrast to a human workforce. Machines excel at tasks humans ﬁnd mind-numbingly boring. They can gather, analyze, and execute data-driven tasks faster and more consistently than any human. So, machines are pretty smart, right? Not really. Most people understand the idea that there are tasks ideal for machines and tasks ideal for humans. However, it is still not clear how humans and machines work together. Winston, a new prospect, is in a wheelchair. He wants to better understand the level of handicap accessibility the property has before he schedules a tour at Boulevard at B. So, he sends a message via Facebook to ﬁnd out more. Sally, the leasing agent at Boulevard at B has been swamped for days. One of her residents set oﬀ the ﬁre alarm and the sprinklers went oﬀ in the entire building. Residents are furious that their apartments were soaked and many of their personal items were ruined. Sally has been trying to handle this along with her already scheduled tours. After a few days, she is ﬁnally able to start checking on prospect inquires and sends a quick response oﬀ to Winston about handicap parking. She feels a little guilty knowing he’s been waiting for a response, but she simply didn’t have the time to answer sooner with her crazy week. Winston reads the response from Sally and is annoyed that it only addressed parking. He takes this as a sign the staﬀ at Boulevard at B won’t be accommodating and scratches it oﬀ his list. Since Winston never sent Sally an email address, she is unable to follow-up with him via email. Liam, who is the Social Marketing Director for Boulevard at B, reviews this conversation and is frustrated. He spent weeks carefully crafting his Facebook Response plan and held several training sessions on the topic. Not only is his plan pushed to the wayside, Facebook Messenger is actually deterring customers from leasing with Boulevard at B. In this humans-only scenario, every party involved is left unsatisﬁed by the interaction. Winston is unhappy with the poor response, Sally is disappointed she was not able to be more helpful, and Liam is frustrated Boulevard at B just lost a new prospect. Let’s see how the Humans + Machines approach can help. With a digital workforce, marketers can plan the Messenger communications and agents only need to respond when the prospects have speciﬁc or unique questions. In a Humans + Machines strategy, Facebook Messaging starts with Liam, the marketer. Liam is able to program the digital workforce to automatically respond to prospects with responses he wrote. Once Liam does this, he only needs to monitor conversations to see if he needs to add more responses. 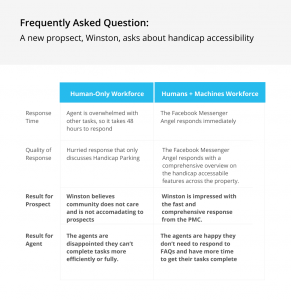 In this scenario, when Winston asks Boulevard at B about handicap accessibility, the digital workforce responds with a thoughtful and complete overview of the accessibility at the property. Winston is impressed by the fast and helpful response. In the Humans + Machines example, every prospect receives polished, branded and immediate responses designed by the marketers. Agents no longer have to spend time answering the same questions for every prospect. Now, they only need to step in when speciﬁc or unique questions are asked. Plus, the digital workforce increases the amount of leads captured through Facebook. Overall, the process becomes smooth and consistent, all while the human workforce is doing less work. Now that’s scale! Together, a Humans + Machines workforce is happier, smarter, faster and more consistent. By creating a system that plays to the strengths of each member, you can reimagine your workﬂows. Digital Workforce sounds a little intimidating. To us, the digital workforce helps, guides, and assists humans to their best selves, just like a little guardian angel. So, we like to call our digital workforce digital angels. Each angel specializes in one simple task. However, these simple tasks can be painfully time-consuming for humans to do or require intense data gathering and number-crunching. For example, something as basic as sending a birthday email to every resident could be a full-time job for a human. Now, it would be silly to hire someone to just send birthday emails, even though it is a nice, personal touch. That’s what is great about the digital workforce. A ‘Birthday Angel’ can wake up each morning, identify all the residents with a birthday that day and send them a personalized birthday greeting. Repetitive and menial tasks like sending a birthday email are done automatically and aﬀordably! Let’s explore what else these angels can do! Prospect Angels, as you would expect, are focused on helping manage prospects. Lead Capture Angel: The Lead Capture Angel can automatically import new leads into your CRM. Tour Scheduling Angel: This angel can get tours scheduled in under a minute. Pre-Tour Angel: This angel is designed to get leads to tour your property. Post-Tour Angel: The Post-Tour Angel reminds prospects why they fell in love with your property. Closing Angel: This angel accelerates the lead-to-lease cycle by sending your prospects updates on the current special oﬀers. Win-Back Angel: This angel revitalizes old leads and increases the value of your list rentals. All together, the Prospect Angels can help your agents get more leases signed. The Resident Angels live to help agents and marketers engage with residents. Pre-Move Angel: The Pre-Move Angel eases the transition into residency for new residents. Welcome Angel: This angel introduces new residents to the area soon after they have moved in. Satisfaction Angel: A Satisfaction Angel checks in with current residents to make sure they are happy. Renewal Angel: This angel inspires residents to renew their leases. Exit Angel: The Exit Angel maintains a positive impression during the move-out process. The Resident Angels help to increase resident satisfaction and resident referrals. Operational angels are designed to keep business operations running smoothly. They work alongside the resident, prospect and dormant lead angels to be as effective as possible. Facebook Messenger Angel: The Facebook Messenger Angel can answer your prospect’s and resident’s common questions. RSVP Angel: It is able to RSVP prospects, residents and dormant leads to community events via email, SMS, or Facebook. Reminder Angel: The Reminder Angel keeps residents and prospects from forgetting important events like tours or community events. Alert Angel: An Alert Angel sends new, interesting updates to prospects and residents. Website Monitoring Angel: The Website Monitoring Angel tracks any prospect or resident activity on your website for you. Facebook Monitoring Angel: The Facebook Monitoring Angel tracks and records any prospect or resident activity on Facebook Messenger. Email Monitoring Angel: The Email Monitoring Angel takes note of any prospect or resident email activity. Integration Angel: The Yardi Angel seamlessly integrates our data with Yardi and Entrata data systems. These angels work on the back-end to get more leases signed and renewed! Digital Angels look out for all of your employees. From marketing to management to leasing agents, there is an angel for everyone! The angels take care of the boring tasks and give your employees more time to do what the machines can’t: Build personal connections. We have covered how angels can alter workﬂows and their areas of expertise. Now, let’s get back to where this all started. We are going to explain how digital angels can solve multifamily’s biggest structural and resource-related issues. We started this guide with a long list of symptoms of an un-scaled operations structure and diagnosed the two structural issues preventing multifamily from scaling. Let’s refresh ourselves on these problems. All of these problems can be solved with the Humans + Machines strategy. That is, creating an superhuman workforce that combines the strengths of humans and machines. For each problem, we will show one of the Humans + Machines solutions. As you are probably tired of hearing, agents have way too much to juggle on a daily basis. The digital angels can take over many of the repetitive and menial tasks for agents and marketers. Instead of agents playing phone or email tag with prospects for days to schedule a tour, a better solution would be to provide prospects with an automated scheduling tool where prospects can do it themselves. The digital angels turns a several-day process into a minute-long process! Bonus: By removing menial tasks from your agents to-do list, agents can spend more time doing what they love. Connecting with people. This will make your employees and your bottom line a lot happier. At the beginning of this article, we talked about how multifamily rarely nurtures leads or engages residents. Both of these problems can be traced back to the same root issue: Poor Communication. Many PMC’s are falling behind because they do not have the time or resources nurture prospects or residents. With a digital angels, engaging prospects and residents is easy! For example, you can program the digital angels to send a series of automated drips. These automated drips can send multiple emails to the target audience over the course of several days. All the agents need to do is program the email cadence and the digital workforce can take care of the rest! Here’s an example of a ‘Automated Welcome Play’ designed to engage and educate new residents. Marketers can ‘set it and forget it’ while the digital angels provide nurturing and consistent communication to prospects and residents, saving the agents time! Most PMC’s are struggling to follow-up with prospects regularly due to their overwhelming schedule. By using an intelligent customer relationship management software (CRM), agents can quickly identify prospects that need an agent to follow-up. Below is what a prospect dashboard would look like with Hy.ly’s digital angels on your side. As you can see, each prospect is automatically placed in a pipeline; automatically sorted within each column of the pipeline; and even marked if they visited the website or clicked through an email using an alert bell. All this organization allows an agent to work through auto-prioritized list of prospects! Between the automated drips and auto-prioritizations, you can be sure that prospects aren’t fall through the cracks. By solving the ‘symptoms’ of an un-scaled PMC, it has solved the structural issues that prevent multifamily from scaling. While the digital angels worked to resolve the surface level problems, they also chipped away at the structural issues. Let’s see how Hy.ly’s Angels do it! All of the above examples demonstrate how angels can make many routine decisions. This means employees don’t need to be trained on as many things, which decreases the training cycle. In other words, by programming best practices into your digital workforce you can reduce training costs, train agents faster and have a happier workforce! 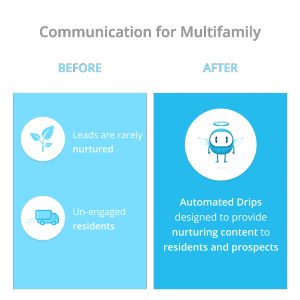 The combination of the automated drips, ‘sense and respond’ technology, and an intelligent CRM allows multifamily companies to regulate follow-up and communications. This gives the company a consistent outreach cadence and happier customers. Plus, marketers can program the communications sent by the digital workforce to reflect the look and feel of the company brand. With your properties operating with consistent branding and follow-up, you can establish a consistent customer journey, experience and reputation. As you can see, digital angels can solve a lot of problems for multifamily. These solutions beneﬁt employees, residents and prospects. Employees can reduce the amount of repetitive tasks they need to do and focus on more fulﬁlling aspects of their jobs. Prospects and residents receive fast, nurturing communications and form closer relationships with the on-site team. So, now you know how you can solve the scaling problem and understand the beneﬁts of augmenting your workforce. Next, we are going to show you why investing in a digital workforce is not only a solution for current problems, but how it can fundamentally change your company for the better. Want to learn more about Autonomous Lifecycle Marketing? We have talked about how a Humans + Machines workforce can improve processes, systems and productivity. But that is just the beginning. A digital workforce is the basis for a virtuous cycle of success. From increased NOI to attracting more owners to managing more properties, the digital workforce can change multifamily’s economics. What is a Virtuous Cycle? A Virtuous Cycle is when one success leads to another, and then another, in a repeating loop. Before we jump into the Multifamily Virtuous Cycle, let’s take a look at Netflix’s Virtuous Cycle. Netflix invests in producing more shows. With more shows there is more variety, which means there are more watchers. More watchers means more talkers. This leads to more subscribers. More subscribers generate more revenue. With more revenue, Netflix can invest in more shows. As you can see, the cycle fuels itself for future success. By creating more shows, Netflix will set off a chain of events leading to more revenue. As long as Netflix keeps investing in new shows, the cycle will continue. Now that you have seen a Virtuous Cycle, let’s explore how a digital workforce can do this for multifamily. How Does it Work for Multifamily? To create a Humans + Machines workforce, you need to add a digital workforce to work alongside your employees. Increasing the digital workforce will kick-start a positive chain reaction. Ultimately, ending with companies managing more properties. Just like how more shows fuels the Netflix Cycle. The first step in the Virtuous Cycle is to invest in the digital workforce. Adding a digital workforce lowers personnel and operating costs. One ‘digital worker’ can do the work of 100 people when it comes to repetitive tasks. For example, an automated nurturing drip campaign can follow up with all of the leads at once. An agent can only follow up with one lead at a time. By enlisting the help of a digital workforce, employees can work smarter not harder! The digital workforce can handle time-consuming tasks. This gives agents more time to cultivate relationships with leads. Better relationships will lead to more leases and revenues. To recap: A digital workforce can decrease personnel costs, lower operational expenses, and increase revenues. By deﬁnition, this will increase the company’s net operating income (NOI). With an increased NOI, the company can deliver owners a higher profit margin and more competitive bids. More competitive bids attract more owners. When you attract more owners, you get more properties to manage and increase revenue for your PMC. With more money, you can reinvest in the digital workforce and the cycle continues! Now that how scaling operations using a Humans + Machines workforce can help you become a leader in the multifamily Industry. Are you ready to change the economics of your business with the digital workforce?